Are you planning to go out there fishing for long durations? It would be a good thought to have some entertainment with you. Getting yourself best marine stereo ensures that you can load your favorite audio hits and keeps you motivated. You need to look for the one that is more resistant, have enhanced signal reception and offer a better sound. In this article, we will give you some tips on how to choose the best one. 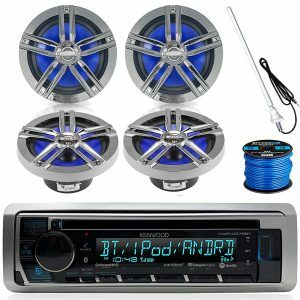 Moreover, we have gathered the top 10 best marine stereos for you. Quality of Features: You should get a unit that has unlimited intuitiveness and better sound power. There is some unit that is made using modern technology thus offer excellent sound quality and are compact size. On the other hand, it’s a good idea to look for the one that is easy to install. UV Resistance: Since marine equipment is exposed to the sun for a long time. It’s good to choose a unit that has the capability to withstand sunlight rays impacts. Look for a stereo that has faceplates, UV-protected speaker cones, and remote controls. Water Resistance: If your Marine Stereo is water resistant, that shows that it cannot be affected by water splashes. Normally Water resistance levels differ from one unit to another, it, therefore, needs to go for a unit that provides reasonable protection whenever you are planning to fish under the rain or in rough waters. Specs: Last but not least, look for a Marine Stereo that boasts a great combination of features. Look for the one that has at least FM/AM input, CD and USB. The unit that comes with separate speakers is better compared to one that you need to purchase speakers separately. The Kenwood KMR-D765BT Marine Stereo is on the top of this list because of many reasons. First of all, the stereo will permit you to use Spotify, iHeartRadio, and Pandora, or browse your favorite music collection. Other than that, the gadget is completely waterproof and it’s constructed with a conformal coating that keeps the moisture out. For more protection, the stereo is made with a heavy-duty aluminum alloy that prevents overload, thermal and overheating as well as short circuit protection. The Kenwood’s remote application enables you to control this stereo using your phone. Furthermore, it comes with an in-built Bluetooth technology to connect the Stereo to other Bluetooth enabled devices. 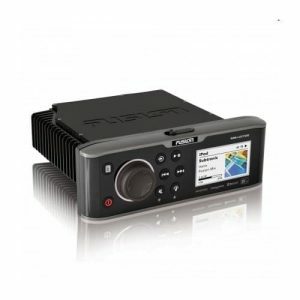 The Fusion MS-UD750 is a compact marine stereo that packs a large amount of functionality. 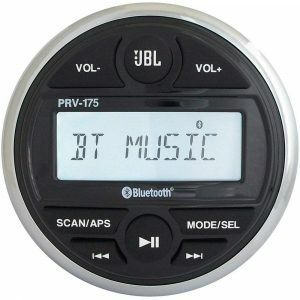 It features Bluetooth streaming capability thus you can connect Bluetooth enabled devices such as the smartphone, iPhone and iPad to browse music libraries. Similarly, this entertainment system has a widescreen bonded color LCD display for a night and daylight viewing. 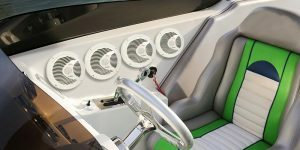 Featuring Bluetooth audio streaming, you can be able to stream music from other Bluetooth enabled device allowing boaters to relish their favorite music. Installing this device is very simple and you can use it in personal watercraft, tenders and small boats adding brilliant sound to vessels. Our next pick from the Kenwood, which is a perfect fit for all types of boat and watercraft system. This stereo receiver is going to provide abundance music to break the noise of waves and wind. Designed with rugged yet durable look together with weather-resistant material and this proves that it’s perfect for outdoor listening experiences. 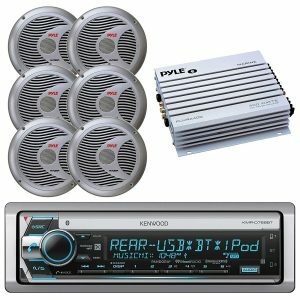 This stereo receiver features 6.5 inches speakers that resist deterioration from UV rays, moisture, and salt. Its conformal-coated circuit board hinders moisture and will protect this unit from water and dust. Furthermore, the unit comes with AM/FM Radio Antenna and front USB input. 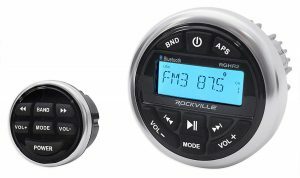 The Rockville RGHR2 Marine Stereo is the epitome of quality and class. It provides 28 watts x 4 channels with proper fader, balance, bass, treble and built-in EQ to customize sound depending on your taste. The unit also comes with a USB that allows you to listen to the music that is stored on drives. In addition to that, with its Bluetooth technology allows connecting to Bluetooth enabled devices and stream music. Another great feature that comes with this marine receiver is that it has 2 sets of pre-amp outputs that enable to hook up any other external amps for subs or speakers. 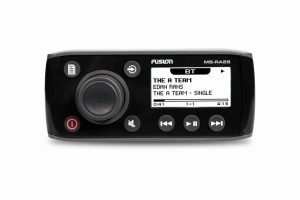 The Fusion MS-RA70 Marine Entertainment System is one of the decent stereo systems you can find in the market. It’s perfect in terms of construction performance and quality. Furthermore, this item features a fusion-link remote control application; you can control the system right in your phone. Integrated with panel mount USB cable as well as build in Bluetooth technology. The system is usually engineered precisely for the marine environment, as it’s made with IPX7 front panel and optically bonded LCD that delivers clear display on the high sea. As a matter of facts, the system will let you sit back and relax listening to the local Am/FM station. 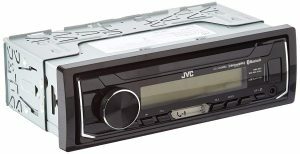 The JVC Marine model is an ultimate marine stereo of the present time with all important feature to enjoy listening to music out in the water. It comes with plenty of connections such as Bluetooth for audio streaming and hands-free talking. Other than that, this device is compatible with iOS 8 software and Apple iPhone 6/6+ and any other smartphone. The receiver features a reverse display that cuts through glare making it perfect for open-top cars. The design is compact and user-friendly with amazing power for dynamic and clear sound. The display is also great. Generally, it is a great item available at a great price. The Pyle Marine receiver is another complete package you can find in the market. Featuring with four waterproof marine grade speakers, AM/FM radio with 30 presets, USB flash drive reader, Aux (3.5mm) input jack, micro SD card reader along with built-in Bluetooth. The unit will allow you to Stream an entire MP3 playlist supporting the digital audio file. The digital LCD display screen and front panel control are easy to use and quick to access. The Display of the stereo is readable and big enough thus everyone can use without any problem. Markedly, you can adjust fader, treble, balance, and bass for full range stereo sound. 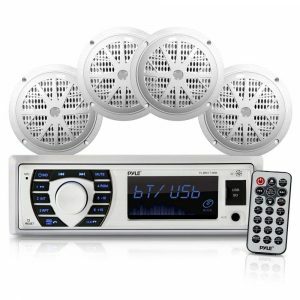 Another Stereo Receiver from Pyle will take your marine experience to the next level. 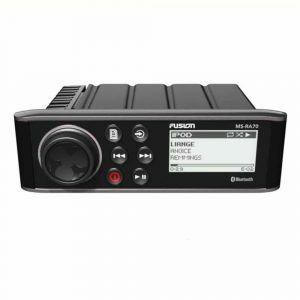 It’s ideal for marine watercraft, boat, and off-road vehicle and automobile and features LCD and control buttons that allow controlling the preset equalizer with ease. It not only have wireless music streaming receiver but also features front-panel microphone that you can use for hands-free calling. With 30 AM/FM stereo radio tuning you can listen to your local radio stations and also features SD memory card readers, USB flash, aux (3.5mm) input jack to stream audio from external devices. Get it today and you enjoy your marine experience. If you are a lover of loud and swift music on the board of a boat or watercraft, Prospec Electronics Marine Boat Stereo is for you. The speakers of this set are corrosion resistant and waterproof thus no worry about being affected by water. With the 2-way attachable secured design, it offers prior protection against shakings due to waves on the see. The button controls are illuminated on the head unit of this device. It also comes with 3.5mm connector jack, USB input ports to play audio from external drives. Buy it once and you will use it for years and years without any fault in the performance. 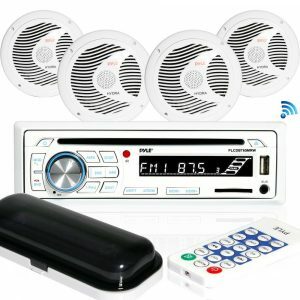 Now we have reviews for you the top 10 best Marine Stereo presently in the market. Without this guidance, selecting the best marine stereo feel, confusing and irritating. Purchasing the best stereo makes your marine journey memorable. We hope that now you know the best options for you.